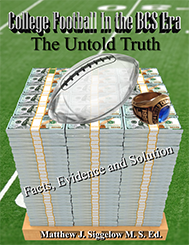 If college football possessed an expanded playoff format which included all FBS programs equal and just opportunity to compete for; the $50 Million Dollars at stake, the crystal football trophy and the right to earn and be called a “National Champion”, what would that bracket reveal? Since published research supports that an expanded college football play can be implimented with a field of 16 FBS programs, then what would the early version of playoff pairings look like. The breakdown of this field indicates that 13 FBS programs are from the Power 5 Conferences and 3 FBS programs are from the Group of 5 Conferences. Taking the break down even further, ALL P5 Conferences would have representation within this expanded playoff format; 3 each from the Big 12, Big 10 and ACC, 2 each from the AAC and SEC and 1 representation from the PAC12, Independents, and MAC. This style of an expanded playoff format allows all FBS programs from ALL of the FBS Conferences and Independents, an equal and fair opportunity to compete for the National Championship. All the Group of Five Conference FBS members and the 3 Independent FBS members want, is an opporunity to compete for what’s at stake at the end of the college football season. Just like the other 87 NCAA sponsored Championship Events, all FBS schools are considered to compete for the National Championship. It is only the NCAA ponsored sport of Football, in which ONLY the FBS members from the Group of Five Conferences are NOT considered. The current CFP system and the previous BCS system are based upon an exclusive club membership based upon sports media lable status and not who has earned the right to compete for the “National Championship”. The CFP committee has a tough time narrowing the field to the four FBS teams they believe should be part of the playoff. Expansion to 16 FBS teams makes it fair for all FBS programs within college football. Time for a change. As the remaining weeks play out within this 2017 FBS college football season, this MOCK expanded playoff seedings will change.